An epic 25 mile plus circular walk from Pateley Bridge to Scar House Reservoir via Wath and Lofthouse before returning via Middlesmoor, Ramsgill and Heathfield. Following our decision to combine stages two and three of the Nidderdale Way into one long day today was the big day! 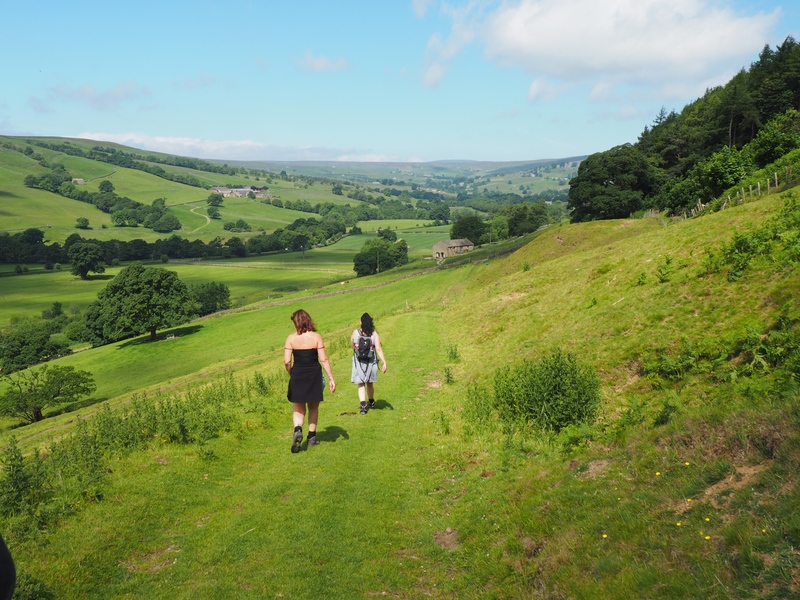 With approximately 25 miles of walking and a forecast promising a hot sunny day in the high twenties we knew it was going to be a much tougher day than the easy walk from Ripley to Pateley Bridge on day one. Having fortified ourselves with a fine English breakfast at Harefield Hall (highly recommended by the way) we walked down the river to the centre of Pateley Bridge. The next job was for us all to choose a pie for lunch from the award-winning Weatherhead Butchers and then meet by the bridge to start the day’s walking proper. Despite the forecast it was actually a cloudy start to the day. Normally I would have been complaining about the Met Office’s latest failure to predict the weather properly but on this occasion I was glad that we had the chance to get some miles in before the sun came out. So it was that we enjoyed a relatively easy start to the day with the riverbank path heading north from Pateley, passing Wath and on to Gouthwaite Reservoir. Having followed a good track on the eastern side of the reservoir we next passed through the small hamlet of Bouthwaite. After a short climb up through some pastures towards Longside House the views of the valley ahead really began to open up. It was at this point that the skies suddenly cleared and for the next section of the walk, below Longside Wood, we enjoyed some truly beautiful views of Nidderdale. Eventually the path led us back down into the valley to cross the Ramsgill to Lofthouse road at Low Sikes. A few pastures later we were back on the road for a short distance before crossing another couple of pastures to reach Lofthouse. Already the sun was making its presence felt and the temperature had risen significantly since we’d lost the early morning cloud cover. A short climb up the road out of Lofthouse brought us to the lovely bridleway of Thrope Lane. This is a superb path that I’ve trodden a few times in the past and this led us up into the upper reaches of the valley. After passing Thrope Farm the path dropped down to ford the River Nidd at Dry Wath. As its name suggests there was little problem crossing here, indeed the river bed was virtually bone dry. Passing through Limley Farm and its usual pack of barking dogs we saw a magnificent specimen of a bull in one of the barns before dropping back to cross the river again. On the other side was a very steep zigzag path climbing up through bracken. It was sweaty and uncomfortable walking with the sun beating down on us, no breeze and the thick smell of bracken in the air. I admit that by the time we reached Thwaite House I felt knackered and for the next mile or so barely had the energy to take any photos. Not a good sign when we were not even at the halfway point for the day!! Thankfully I managed to make a recovery of sorts over the next mile as the track contoured around the farms at Bracken Ridge and Summerstone Lodge. Past New Houses Edge Farm the track began to descend which frustratingly led to a climb up to Woo Gill followed by another steep descent and climb back out of the gill. Eventually we reached the shores of Scar House Reservoir, which was positively glistening in the sun, where we stopped for lunch and to enjoy the pies we’d bought that morning. The refuel was perfectly timed as the next section of the walk, across the dam, was a steep climb below Woodale Scar and up on to Woodale Moss. Shortly after this we reached the 434m spot height on the map and the highest point of the Nidderdale Way. There followed a gradual descent towards Middlesmoor with spectacular views of Nidderdale ahead of us. We were however all suffering from the heat again and the water trough in Middlesmoor provided some welcome cold water. From Middlesmoor we dropped down a couple of pastures to cross Stean Beck at a footbridge. Climbing up the other side we then turned left on the narrow lane leading to Stean. Passing How Stean Gorge we paid a quick visit to the visitor centre cafe to restock up on drinks. Carrying on down to Studfold Farm we had another short climb up to reach the enclosed Blayshaw Lane. This eventually gave way to a nice green bridleway and only our second encounter with cows that day. The bridleway dropped ever so gradually to finally bring us to Ramsgill. There followed a tiring couple of miles of road walking on the western side of Gouthwaite Reservoir. A couple of us were nearly taken out by a lady driving her red Audi far too fast. She managed to do an emergency stop, glared at us, and then did a wheel spin as she sped off again. This really is quite a dangerous stretch of road to walk along and the Nidderdale AONB really could do with finding an alternative route. Having almost reached the southern end of the reservoir the walk took a couple of cruel turns. Firstly there was a steep climb up to and through some woods to reach Heathfield. Then, even worse, with Pateley Bridge in sight we had to endure the loop heading in the opposite direction via the Providence Mines. Initially this was through a very long caravan site. Then having crossed Ashfold Side Beck we had a steep climb up through the mines and then on to a return track, eventually becoming a metalled road, that seemed to go on forever. After such a long and very hot day this last couple of miles were quite tortuous. Much of the latter half of the walk had been on roads or hard tracks and my feet, which were swollen from the heat, were quite clearly beginning to blister. Hardly anyone had the energy to speak as we all focused on just getting back to Pateley Bridge. Everyone agreed that the walk back along the river to Harefield Hall certainly seemed much further than it had when we’d set off that morning. Nominally the two stages should be about 25 miles but with the added distance of walking to and from our accomodation, together with the added fact that the third stage finished in Bewerley, not Pateley, meant that we had in fact walked over 27 miles. Doing so on what was the hottest day of the year made a massive difference to everyone’s energy levels. It was certainly the toughest day’s walking that I’ve ever done. All things considered everyone had done brilliantly. My worry was would we be in any state to walk the final 14 miles the next day?